The Fury 282 DC in common parlance is a bow rider. Builder Scott Fury calls it a double console (hence the DC) and, fair enough, this boat deserves a special name. A year in creation it oozes quality and thought; this is a worthy companion to the current stable of 8.6 metre Furies. The hull is unchanged, but then this is what underpinned the last outright winner of the WA Boat of the Year award so why change that? The hull does have an option – one that extends to the whole boat. Towing weight of a standard DC is close on four tonnes. To get this below the magic figure of 3.5 Fury can build using fusion technology that results in reduced resin quantities. Like all Furies the DC is a fine offshore fishing boat, but this one has a greater emphasis on the parallel social role. The driving area is sheltered by an open hardtop with no clears needed or fitted. The fabric expansion over the aft cockpit is a cantilever braced by extensions of the hardtop’s grab rails; very neat. The two sliding bolster seats have tricky ratchet hinges that allow almost infinite adjustment to gain the perfect individual’s position. The layout alone of the driver’s console clearly required a good share of that development year. The twin screens, the abundant switch gear and assorted controls take up a large area, but the logic and usability are relentless. One control, an electronic one, is for the top of the market Zipwake interceptor trim tabs. They can link to the GPS to automatically maintain the boat level. A portable fridge lives under the navigator’s seat, although it can be replaced by an upright fridge and a galley unit fitted port or starboard. More seats drop down from the main seats’ backs, matching up with a portable table that can plug in port or starboard – or in the forward cockpit. A sink and drop in barbecue aft complete the domestic arrangements. The forward cockpit is lushly upholstered with settees long enough for sleeping. For that task a cover is supplied that attaches to the hull sides and the hardtop’s front. To simply deal with spray on a rough day a standard cockpit cover is also part of the equipment. Adding to the overnight department is a single berth cabin reached by a door in the port console. The starboard console contains the toilet. Overnighting, or even day cruising, calls for plenty of places to put things – and the Fury has extravagant quantities of them. Underfloor and under seat lockers join with more within the bulwarks – a Fury speciality. Fishing gets its share of attention. Leaving the forward settees at home reveals non skid surfaces that can be linked to provide a casting platform. Fore and aft, at least five fishermen have luxury quantities of space. They share two 120 litre catch tanks and a 70 litre live bait tank. The cray pot hauler uses a derrick rather than a tipper, South Australian style, which is certainly a tidier arrangement. The DC is infested with good ideas and good equipment. Forward is a bow thruster: always handy, especially when driving onto the trailer. And, useful for that job, the trailer has auto catch and release. Also at the bow is a bent link between anchor and chain. This absolutely guarantees the anchor will house itself right way up every time. Fishermen will appreciate the disappearing cleats throughout, and everybody will like the small compartments alongside the seats. These hold personal oddments with the security of screw-in lids. Power can be as much or little as an owner wants, twin or single of any make. The majority will choose twins powerful enough to use the hull’s long proven ability to cope with speed in most ocean conditions. 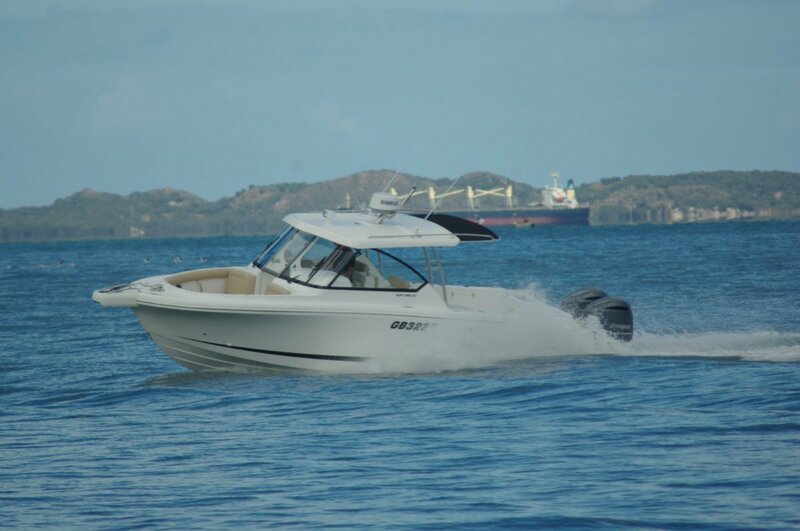 The review boat had twin 225hp Yamahas: good for 45 knots. They are merely purring at 30 knots. Fuel capacity has been upped to 600 litres, extending an already good range.